I played 60 hours of The Witcher 3 earlier this year, and only stopped because I had other games to play. One question always nagged me, though: how did CD Projekt RED put together a sprawling open world game that avoided the genre’s usual preference for meaningless side quests? I called them to find out. The first article I wrote for Kotaku was bellyaching over the mindless fluff in Dragon Age: Inquisition. The game’s sweeping landscapes were lovely to walk around, but too often, what you did in them was boring as hell. I felt the exact opposite with The Witcher 3; the vast majority of the game’s side content filled in satisfying pieces of lore or told their own tiny but interesting stories. There are, quite literally, hundreds of quests available in The Witcher 3. As you gather more and more while exploring the countryside, it can become daunting to figure out where to even begin. But what constantly surprised me about The Witcher 3 is how often I wanted to keep exploring the side quests, rather than plow through the main story and move onto the next game. Though I picked on Dragon Age: Inquisition earlier, it’s hardly the only offender. Open world games are notorious for stuffing their big worlds with boring side content. It’s almost seemed inherent to making an open world game. CD Projekt RED tried to avoid this by flipping their design process around. Some games, like The Elder Scrolls V: Skyrim, have experimented with systems that craft infinite quests for the player, even when the story is over. For a while, CD Projekt RED played around with their take on this for the game’s monster contracts, in which Geralt travels to various towns to fight unique creatures. It didn’t work very well in Skyrim, either. Instead, they went back to the drawing board, and came up with a way to write and develop monster contracts on their own without overwhelming the team. Nothing in the game is procedurally generated, in fact. The process for pitching open world quests was a give-and-take between writers, designers, artists, and everyone else involved in making the game. In most cases, the stories littering the open world were first conceived by trying to reuse assets already made for the game, rather than coming up with new stuff. The rule, said Szamałek, was to not write more than 15 lines of dialogue. The earlier in development, the easier it was to argue for making something more ambitious. One of the game’s most memorable side quests, in which players investigate a wizard studying cheeses, wasn’t meant to be more than a small room. The concept was thrown around as the studio was winding down on a Friday night, but the team got behind the quirky idea, so it kept growing. As a game moves closer and closer to completion, however, things get hairy. The game’s writing, for example, had to be finished roughly six months before the game ships, since there’s so much production involved with recording the dialogue, implementing it into the game, and making sure it all syncs nicely. This was especially true for the side quests. In one quest, it changed enough that the dialogue no longer made any sense. It was too late to record anything new, however, so a last-ditch effort was made to copy, paste, and stitch pieces of dialogue from four other quests in the game and hope that nobody would notice. “As far as I know, nobody even realized that,” said Szamałek. The level designers have things a little easier, with deadlines closer to the game’s release date. But that doesn’t mean there aren’t hiccups along the way. As the team prepared an E3 demo a few years back, it became clear the way Geralt climbed around the world didn’t work. 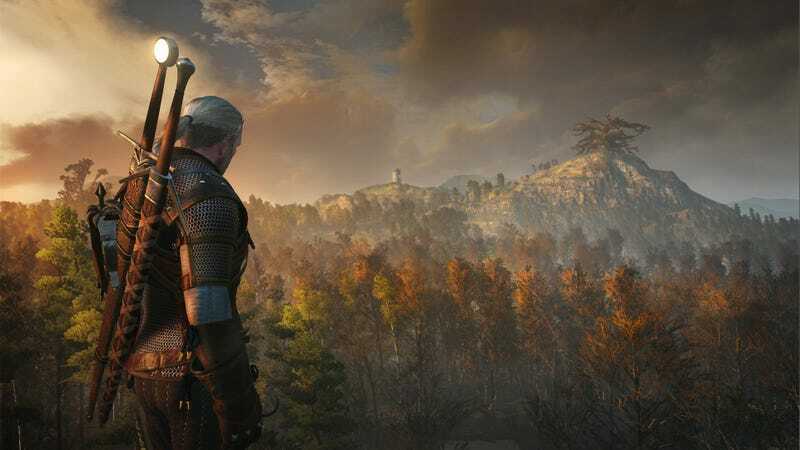 They wanted to encourage players to go wherever they want, but to make the E3 demo function, the developers had to modify every single object in the world and flag it as something Geralt could or couldn’t climb. The team wouldn’t have time to do this for the entire game. Instead, they came up with a new system that let him climb anywhere, but this required completely rethinking the game’s level design. CD Projekt RED discovered one unfortunate side effect while playtesters were working through an early version of the game. In this sequence, Ciri is recovering in a sauna from an injury she’s sustained in battle. The massive critical and commercial acclaim for The Witcher 3, however, seems to suggest the studio’s attention to detail has paid off. This obsession covered every aspect of the game, including what material made up the walls of Novigard, one of the main cities. The team spent a whole meeting researching what would be appropriate for their world; to them, having a world full of monsters didn’t give CD Projekt RED a license to throw all logic out the window.